Energy from the sun can heat and cool your home, replacing dirty and expensive oil or propane. A typical homeowner can save hundreds of dollars each year with solar heat, and enjoy clean energy air conditioning in the summer, too! Sign up for your free solar home visit, and one of our Solar Home Advisors can draw up a proposal with our low-interest financing options. 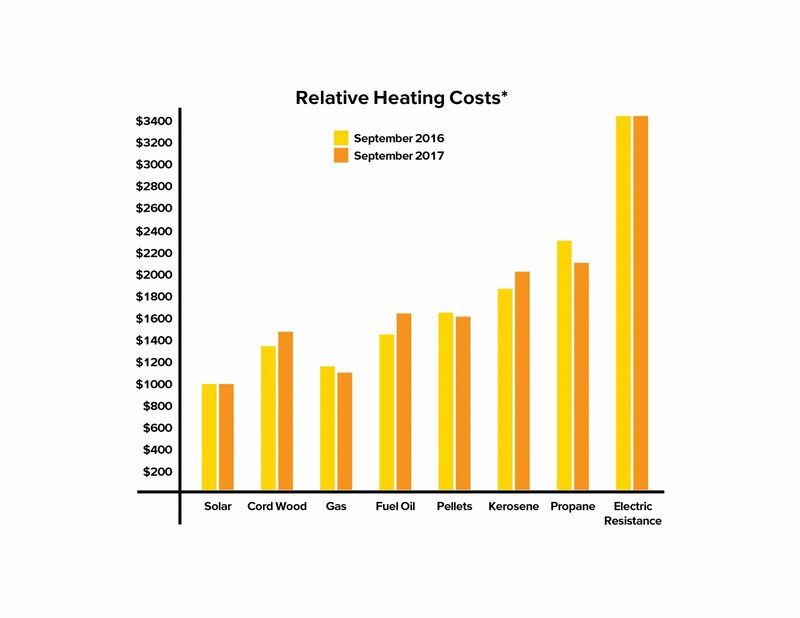 How much could you save with solar heating? How Should We Connect With You? Our team is currently looking at your information and can provide you more detail on what you can save. Please enter your information so that we can connect with you. In Vermont, your utility will pay you to switch to heat pumps. There are additional incentives available through Efficiency Vermont. Powering heat pumps with solar power is the least expensive way to heat your home through the winter – and cool during the summer. *Based on data from the VT Dept of Public Service. 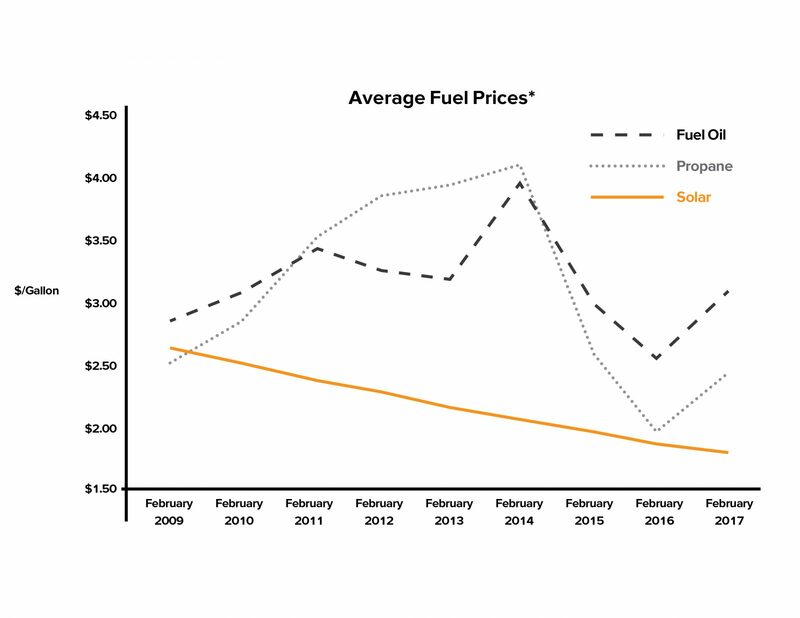 Solar energy cost determined by using the cost and energy output of most common system design and financing package. Join the 450 other SunCommon customers heating & cooling with solar! The outside unit sits on the ground or mounts to the side of your house. The size of the outdoor unit varies based on the number and size of the indoor units it powers. Solar heating and cooling is quiet and comfortable. This smart technology can keep your home consistently warm and cozy through the winter — and dry and cool all summer long. Allergens and dust are filtered out as the heated or cooled air is circulated in the house. The installation is easy and takes typically just one day. 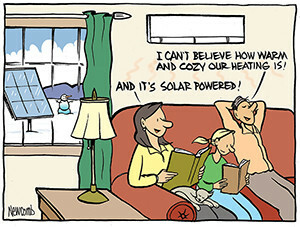 Heat pumps are a great solution for Vermonters. They provide year round comfort at a fair price and are a perfect match for solar!! The feedback we get from our clients is “exceeds expectations, quiet and comfortable." Tired of dirty fuel heating your home? Solar systems produce more power than a home needs during the summer, spinning the utility meter backwards and building up a big electricity credit. You can use that credit at night and during the shorter days of winter to run your ultra-efficient heating and cooling unit. 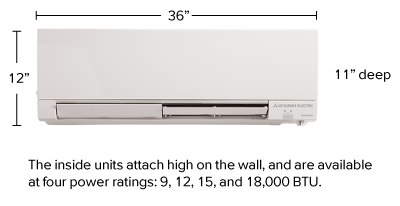 Lastly, what does a heat pump sound like? Check out the video!